Blogo WP v1.5.1 is available. 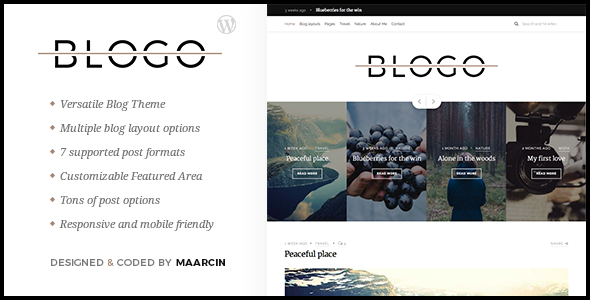 Scroll down for details Blogo is light and elegant WordPress Theme created for Bloggers and Writers. Blogo can be easily adapted to any kind of blog. Variety of options and blog layouts will help you to set up your own blog within a minutes. Extremely easy to use with live options preview (see the changes before saving them in a real-time preview). Carefully crafted and coded with best practices in mind makes sure it’s user friendly and SEO ready. Includes support for most popular plugins and features like Instagram, Google Fonts, Featured Area sliders and more. It’s also coming with built-in Distraction Free Mode that will help your visitors to focus more on the post content and avoid any distractions. Blogo has been tested with browsers IE9, IE10, IE11, Firefox, Safari, Opera, Chrome.